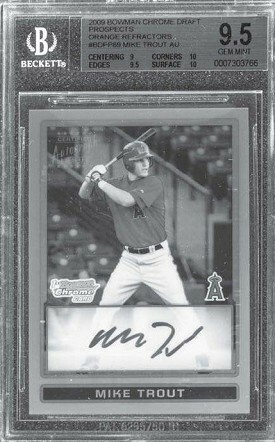 Arookie-year Bowman Chrome Draft autographed card of Mike Trout sold for $186,580 in Goldin Auctions’ 2019 Winter Auction that closed March 2. 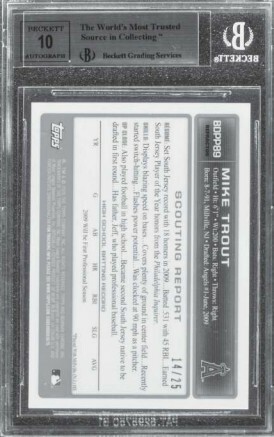 The card is an Orange Refractor parallel to Trout’s regular 2009 Bowman Chrome Draft, and is #’d 14/25. This copy was graded 9.5 Gem Mint by Beckett Grading Services and received a 10 for the autograph.